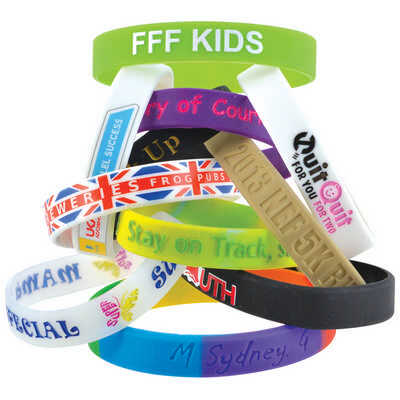 Custom Colour Silicone Wrist Bands with diverse range of decoration options. We`ll match the band to within 10% plus or minus of your Pantone® Colour Choice. Available in 3 sizes. Colours - Custom Size - Adult :12mmH x 202mmC x 2mm thick, Youth: 12mmH x 180mmC x 2mm thick, Child: 12mmH x 150mmC x 2mm thick Decoration Area(s) - Screen Print : Child - 150 x 9mm (LxH), Youth - 180 x 9mm (LxH), Adult - 202 x 9mm (LxH); Debossed : ; Debossed with Infill : Child - 150 x 9mm (LxH), Youth - 180 x 9mm (LxH), Adult - 202 x 9mm (LxH); Embossed : Child - 150 x 9mm (LxH), Youth - 180 x 9mm (LxH), Adult - 202 x 9mm (LxH). Price includes : 1 Col Band Debossed. Setup is included.